Bar-tailed Godwit (Limosa lapponica) of the subspeceis L. l. baueri staging on tidal flats of the Yukon-Kuskokwim Delta. 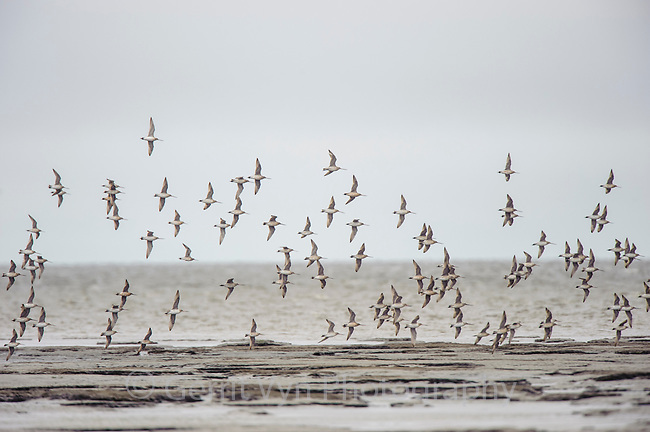 Godwits depart from this location on a direct fall migration to New Zealand. It is the longest non-stop migration of any bird, in some cases birds are flying over 11,000 km from Alaska to New Zealand without stopping. Yukon Delta National Wildlife Refuge, Alaska. September.